Ajax midfielder Frenkie de Jong, 21, wants to play for PSG. He prefers the French champions elect over Manchester City. So he’ll head to France this summer sats the BBC. 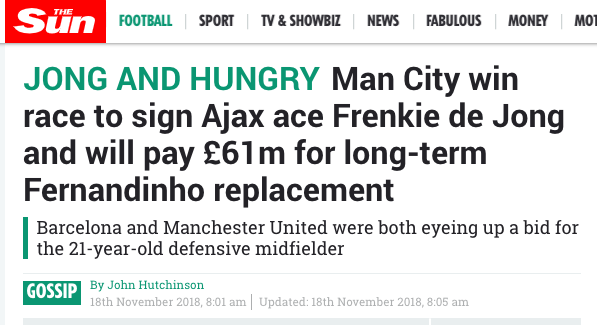 This is same BBC that told us Manchester City had agreed a £61m transfer, pipping Barcelona to his signature. The Sun says it’s his “dream” to play for Barcelona. Confusion reigns, then over the player who is talking about as being every bit as good as – get this – Johan Cruyff, and in a single Guardian article: Franz Beckenbauer, Ruud Gullit and Frank Rijkaard. Yeah, he’s that good. And he’s off to play for Manchester City (if you read the BBC and the Mirror; the Sun said the deal was done) and PSG (if you read the BBC and Dutch newspaper De Telegraph). The Dutch paper says PSG will pay 75m euros (£67m) to sign the Netherlands international. It’s almost a done deal. That tells us how much the great Cruyff would be worth in today’s transfer market. He’s a bargain.